Maryland Home Improvement Master, Inc.
E.M. Texture Construction SVC., Inc. Comment: Stand alone garage to be sided over existing T-111 siding. Comment: Windstorm shook a few pieces loose, there are also some pieces that have holes in them. Comment: Possible Replace siding on gables with T1-11. Possible replace whole house siding depending on insurance. Comment: I would like to get an estimate for repairing my siding. I had a chunk of siding ripped off the side of my home. Comment: Wood panel to be overlaid with wrap, insulation board and mid-grade 5" Dutch lap vinyl. Small 2-story 3-bdrm home with clear access all the way around. Approx 2100 sq ft exterior surface. Comment: Wind storm damaged a section of siding which needs repair or replacement. Comment: Might currently have asbestos siding. Edgewater Siding Contractors are rated 4.62 out of 5 based on 3,785 reviews of 36 pros. 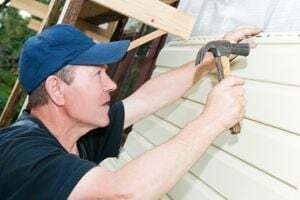 Not Looking for Siding Contractors in Edgewater, MD?